Confronting the Global Climate Crisis: Health Opportunity of the Century? 6:15 pm: Introduction of the Quie & Peterson Global Health Lecture and Keynote by Dr. Jonathan Patz; Dessert reception to follow. Keynote speaker Dr. Jonathan Patz, MD, M.P.H., is director of the Global Health Institute at the University of Wisconsin-Madison. 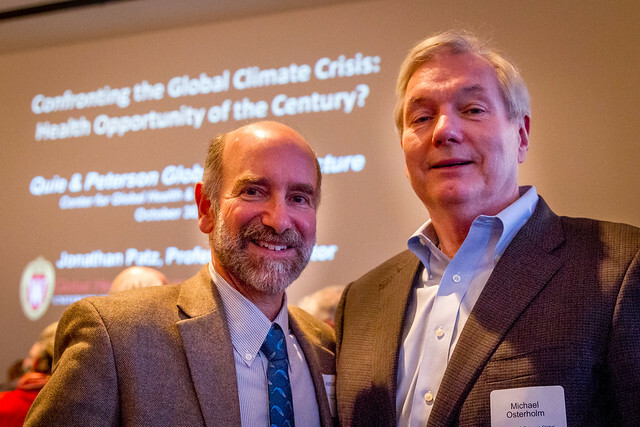 For 15 years, Dr. Patz served as a lead author for the United Nations Intergovernmental Panel on Climate Change (or IPCC), the organization that shared the 2007 Nobel Peace Prize with Al Gore. He also co-chaired the health expert panel of the U.S. National Assessment on Climate Change, a report mandated by the U.S. Congress. Video of Confronting the Global Climate Crisis – Health Opportunity of the Century?